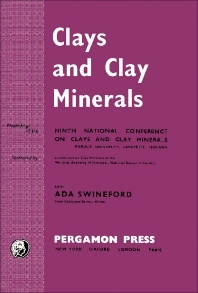 Earth Sciences, Volume 11: Clays and Clay Minerals covers the proceedings of the Ninth National Conference on Clays and Clay Minerals, held at the Purdue University, Lafayette, Indiana on October 5-8, 1960, sponsored by the Committee on Clay Minerals of the National Academy of Sciences – National Research Council. The Conference features two symposia, namely, the “Engineering Aspects of Physico-Chemical Properties of Clays” and the “Clay-Organic Complexes”. This book is composed of 42 chapters and begins with descriptions of the mechanical, structural, thermodynamic, physical, and thermal properties of clay minerals. The succeeding chapters are devoted to certain reactions, theoretical and experimental aspects, occurrence, formation, and sorption properties of these minerals. Other chapters explore other involved mineral reactions, including interlamellar, cation exchange, swelling, and adsorption. The concluding chapters examine the viscometric constants of suspension, stabilization mechanism, and random growth of certain clay minerals. This book will be of value to geologists, mineralogists, and researchers in the field.